How music’s most important technology turns discovery into audience and sales. Driving discovery and engagement is one of the greatest challenges anyone in the music industry faces. Ask yourself: How do you discover and engage with new music ? I’m almost certain it’s not through radio or TV-based music networks. As for streaming, perhaps some of you find new music that’s suggested by whatever service you use, but I’m willing to wager these choices are more often than not a bit far afield from what you actually like or want to listen to. And in any event, they’re not choices that you’re actively attempting to engage with. 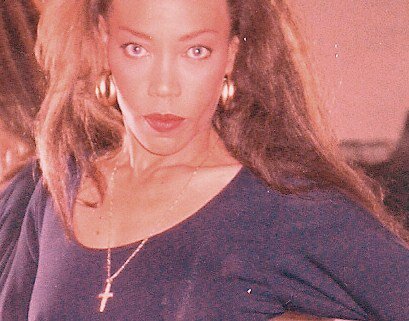 So let’s rule out radio, music video television stations and streaming as effective mass-market discovery and engagement mediums. What’s left? Sync and social media. And while social media has the ability to effectively promote music discovery through friends and influencers, nothing succeeds like sync in promoting new music to the mass market. The reason is simple. Getting a song into an ad, game, TV show or film that reaches millions of people means these people are all exposed to your music. But exposure doesn’t equal engagement. And that’s important, because engagement equals sales. So to truly engage with the music they’re exposed to, potential fans need a tool that lets them turn discovery and intent to direct engagement. And that’s where Shazam comes in. And, that’s why I believe Shazam is the most important technology in the music industry. 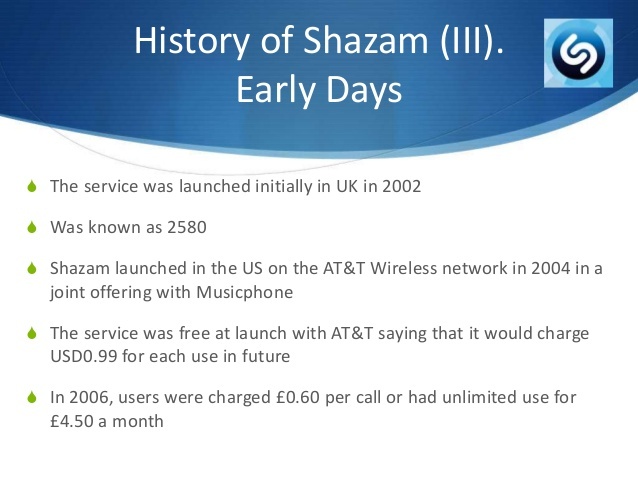 Shazam was founded in 1999 with the mission to make every song you hear easily identifiable through your mobile device, and launched in the UK in 2002 and the US in 2004. So in the US, for 99 cents a pop, you’d call a shortcode to connect to their server from your mobile phone, and from there, you’d hold your phone up, their server would then match the song’s spectrogram to a result in their database, then Shazam would send you a text message with the song title and artist name and later on, a hyperlink to the song. As a voracious music consumer of obscure music, I was an early adaptor and sold on Shazam from the get-go. Finally, there was a way for me to know what was playing, anywhere, anytime. Definitely a cool party trick. As the Shazam app has evolved to integrate functionality that connects its 500+ million users to social sharing, purchase and listening/viewing options, Shazam has also evolved to be the main way consumers discover music and then act upon their post-discovery intent. 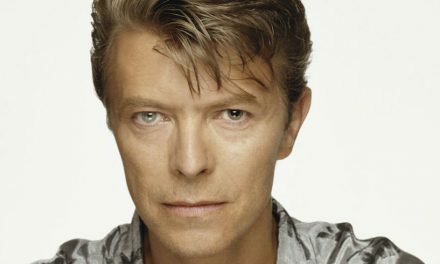 There’s simply no app or utility that makes it easier for fans to discover, then interact with music. If you have the app, you just click the Shazam symbol on your screen when you hear a song you like (i.e., “Shazam” it), wait a couple seconds for the result, and then make your choice of what you want to do next – share, listen or buy. Hear, click and engage – simple as that. 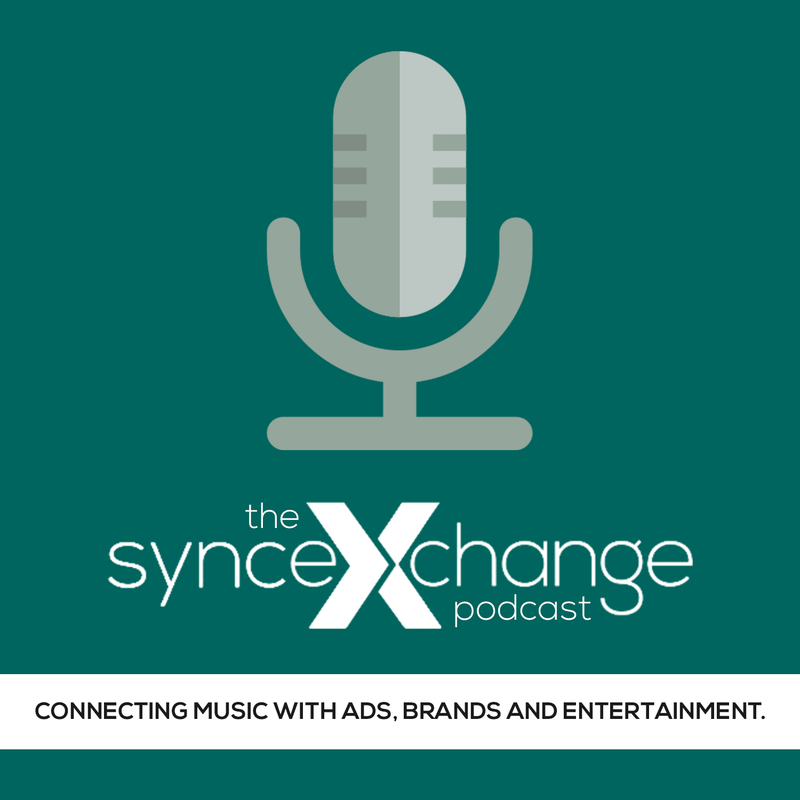 And this has huge, positive benefits for anyone doing business in the world of music, and it does more to make real the promotional value of a sync or getting an original song into an ad or brand or entertainment project than anything else, period. Let me give you a couple of examples of what I’m talking about – one general, one specific to sync. She had a good week last week in the US, didn’t she? 1.71 million CDs sold and 1.6 million digital downloads of her album “25”. The industry hasn’t seen numbers like that since the only sync most of us talked about had a “*N“ before it. As a former charts guy, my mind was blown. Frankly I thought something went wrong at SoundScan (it didn’t – the numbers are totally legit – though still mindblowing). 200,000 Shazams in the first 24 hours after “Hello”’s release – a new record. That means, out of a total of 3.5 million people, almost 2.5 million engaged with the track. That’s just an amazing level of engagement. I challenge anyone to present a better level of engagement from consumers on a music-based call to action than that, because it doesn’t exist. Here’s where it gets really compelling. 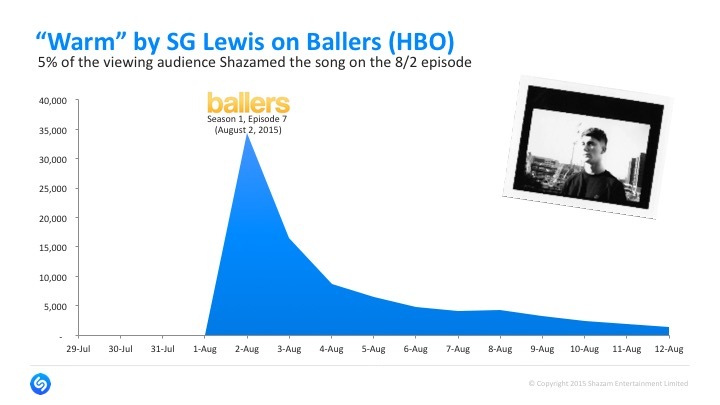 Let’s take a look at some of the numbers and the Shazam-based engagement that happened when Shazamers heard SG Lewis’ song “Warm” on HBO’s “Ballers” 2 August 2015 episode. According to Nielsen, the total viewership for this episode was 1.560 million. And out of that total, 52 percent, or 40,560 people that Shazamed the song engaged with it on some level. That’s amazing. An engagement level of 52%. That’s real interest, and real engagement — with the artist and the music. The takeaway here is that a consistent majority of Shazamers are not only interested in finding out what a track is, they are interested in engaging with that track. At the end of the day, engagement is what it’s all about. And Shazam is the tool that makes consumer engagement possible. That’s why it’s vital for you, if you own or make music, to understand that when you get a sync or compose music for a project you have to make sure it’s shazamable – i.e., that Shazam has it in their database (if you don’t know how to do that, feel free to ask me and I’ll help) so that the potential millions of fans that hear your music in an ad, show or anywhere else can discover and more importantly, engage with your music. PreviousWhat’s a One-Stop and why is it important to you?